Today in Munich Huawei is releasing the covers on their new flagship smartphone. The Mate 9 follows the 8 and 7 as the leading devices under the Huawei brand, each featuring the latest generation HiSilicon Kirin SoC announced at roughly the same time. The SoC in this one is the Kirin 960, as we detailed a couple of weeks ago, and features the first outing of ARM's new Cortex A73 CPU cores as well as the first public implementation of the new ARM Mali-G71 graphics core. Huawei has paired this will an all new CDMA capable Category 12 integrated modem with quad carrier aggregation (4CA) and 4x4 MIMO (at 2CA). The Mate 9 itself is the SoC with an aluminum design with a 5.96-inch Full HD (1920x1080) LCD display, EMUI 5.0, dual Leica rear cameras, and Google DaydreamVR support. As mentioned in our Kirin 960 piece, Huawei (in the Mate 9) is advertising +18% performance on the CPU and +180% on the GPU compared to the Kirin 950 in the Mate 8. The CPU uplift comes from the move to A73 cores over A72, and the GPU is from a doubling from MP4 to MP8 on the GPU along with a new GPU architecture, Bifrost. The CPU and GPU are connected with a new lower power interconnect, ARM's CCI-550, which was promoted as part of ARM's CCI-500 family as offering better efficiency and lower power than the previous generation CCI-400 series. Andrei and Ryan's pieces on both the A73 'Artemis' microarchitecture and the G71 'Bifrost' architectures are well worth the read. For the Mate 9, Huawei is using TSMC's latest 16FFC process - this is a lower cost variant of the original 16FF+ and should be the same 16FFC we see in Apple's A10 cores. Numerous outlets have compared the fact that Huawei is launching a 16nm flagship while others are preparing to launch 10nm devices, however if those are indeed 10nm, Huawei still has 4-5 months (Nov to March) before these devices hit the market and we'll see how they match up in due course. Over the past twelve months, the two key devices in Huawei's portfolio have been the Mate 8 and the P9, so naturally one would expect the dual camera feature of the P9 to migrate to the flagship Mate series device. The Mate 9 has two cameras, and rather than using the dual 12MP sensors in the P9, Huawei is using a 20MP black and white camera in one and a 12MP color camera for the other. The color camera will have optical image stabilization, while both with use up to 4K EIS via the internal DSP. With the dual camera design, Huawei is advertising effects such as post processing bokeh, and a 'hybrid 2x zoom' function which crops the 20MP image to a 12MP image to give the effect of zoom. Leica is still practically involved with the branding, apparently assisting with the lenses and the software. Also into the Mate 9 repertoire are a series of effects from previous generations of flagships, such as light painting, but the new device will support Beauty Mode recording and slo-mo recording up to 240fps in 720p/HD mode (although not beauty and slo-mo at the same time). Both rear cameras are set at f/2.2, while the front camera is an 8MP with autofocus and f/1.9. For the display, Huawei is promoting a 5.96-inch Full-HD (1920x1080) LED display with a 1500:1 contrast ratio and a tailored '2.5D' glass finish. Color gamut is officially promoted as 96% NTSC. 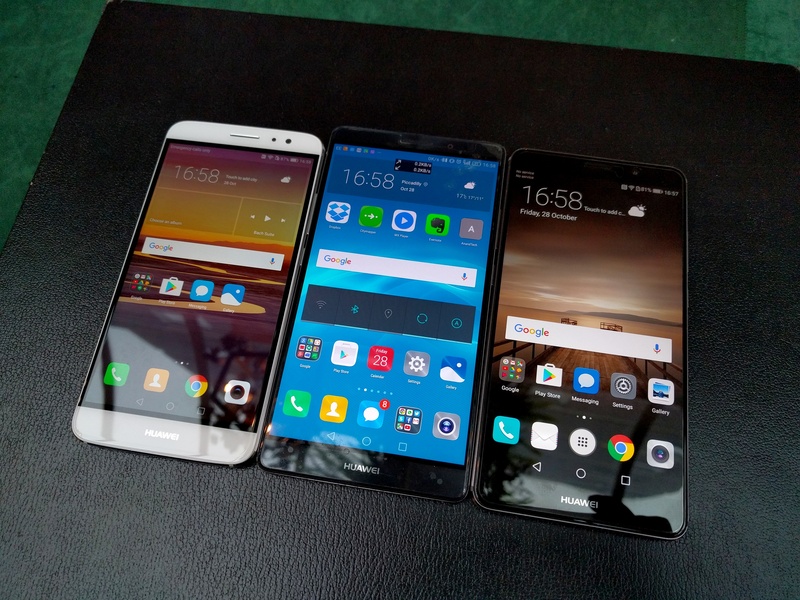 The display will implement the new EMUI 5.0, which as part of our discussions with Huawei's design team is meant to be geared towards ease of use with most applications designed to be 3 clicks away or less. EMUI 5.0 will also feature a new design philosophy centered on blue and white, citing that the minimalist environment and high contrast mirrors a more concise and relaxing user experience. Given Huawei's tendency to ship recent devices with blue screens over the past couple of years (either by chance or design), it seems that blue is here to stay. The Mate 9 does feature a low blue light mode to aid using the device at night, and given previous iterations of this feature it typically adjusts the software LUT and jacks up the greens to give a 'warmer' feel. As a flagship device commanding a flagship price, it will be interesting to see if Huawei has taken steps towards per-unit color calibration similar to its main competitors. The Mate 9 will be available in two storage variants, either 64GB or 128GB of UFS 2.1, and each device has 4GB of DRAM. In combination with the new version of EMUI, Huawei has promised a lower base for memory occupation (i.e. OS DRAM residency, which seemed oddly high with the Mate 8). For additional storage, the dual Nano-SIM design will allow for a single memory card in the SIM 2 slot, supporting up to 256 GB. Huawei will promote that both SIM slots, depending on the region, will be able to support 4G at the same time, rather than the 4G/GSM combinations in the past. This will be interesting to see the effect on battery life, with the rated 4000 mAh battery. The 4000 mAh battery is being quoted as an 'all-day' battery, and Huawei is implementing a 'SuperCharge' scheme using an internal controller in both the smartphone and the charging device itself. Rather than the 9V/2A fast charging combinations, Huawei says that SuperCharge uses on-the-fly dynamic voltage adjustments from 3.5-5V with 5A which can offer 3.5 hours of video playback on 10 minutes of charge. As the charger/wallwart being used also has a controller IC implemented, this charging mode can only occur with branded charging devices but this also allows the ICs to communicate regarding temperatures. Charging at high current invariably adds in temperature through losses, and using internal (non-user accessible) phone sensors the temperature of the smartphone can be monitored and charging adjusted as needed. As part of Huawei's presentation, they are stating that the fast charging temperature of the Mate 9 is better than most (if not all) current high-end smartphones on the market today, offering 58% charge in the first 30 minutes as well. Huawei also clarified that no voltage transformation happens on the phone, and cables adhering to the specification will also be required (the controller IC, or 'SuperCharge Processor/SCP', will adjust for the ohmic capacity of the cable). Huawei will also bundle a supercharger for cars as well with the Mate 9. Connectivity is via a USB 2.0 Type-C connection on the bottom of the phone, and Wi-Fi support is dual-band (2.4 GHz + 5 GHz) 802.11ac 2x2 with Wi-Fi Direct support. This module also supports Bluetooth 4.2 and Low Energy, and with this Huawei is also adding NFC. Next to the Type-C are two speaker grills, and one of the promoted features is the use of four microphones to allow for better recording - one of the promoted software features is a meeting/interview recording mode with various algorithms in place to increase SNR based on input from the various microphones. Having used the Mate 8 for at least six months at this point, I can feel it going slower and more antagonizing to switch apps (at times I multitask as if I'm at my desktop). Huawei has recognized that this is one of the pain points when using 'most' devices, so one of the features that Huawei is promoting with the Mate 9 is onboard machine learning, designed to calibrate and optimize the hardware as time goes on to reduce the impact of an aged system. This was described in the form of learning which apps are frequently used and when, and then learning to optimize the storage for contiguous loading as well as prioritize DRAM accesses and CPU instructions for those important apps. Part of this means that applications that have priority will in effect take over up to seven cores on the device, with the remaining cores for background processing. The priority application thus gets more chances to affect the DRAM controller and request storage access, which Huawei says are now also part of the optimization to limit data fragmentation as time goes on and the device is used. We were able to determine that the machine learning part is both training and inference, and rather than learn through fixed function or specialized hardware, all the computation would be on the cores of the SoC. At present Huawei does all of the analysis on the device, and has not implemented a mechanism for off-site learning or device-to-device learning, in the same way that an autocorrect library might be downloaded to new user devices with certain apps. Thankfully I would expect that the learning and inference of these 'optimization' algorithms is fairly minimal in terms of extra SoC load for day-to-day, so ideally it should not have a hit on battery life. On EMUI 5.0 again and Huawei is reintroducing their version of the app drawer to their design. The EMUI 4.1 implementation was distinctly iOS like, with Huawei previously citing that customers enjoyed the design and it provided a combination of ecosystems between available markets. Despite this, customer feedback on an Android device is typically geared towards various features, such as having the app drawer or enabling the ability to have icons for the same app on different home screens. With EMUI 5.0, through the settings, users can enable these features as they won't be the default setting. EMUI 5.0 on the Mate 9 will also still feature all the knuckle gestures and features as in the Mate 8/S and P9, although there is no Force Touch. We were told that EMUI 5.0 has the Force Touch software modules at its core; however it will be up to the device design to support it. EMUI 5.0 also expands both dual window and dual app sign-in capabilities. Evernote, WhatsApp and Skype will now support dual window, with WhatsApp, Line and WeChat supporting dual-app sign-in. The latter is an interesting implementation allowing users to have two accounts for these messaging applications on the same device, where normally only one is allowed (having a messenger for personal and for work on one device has been regular feedback for Huawei). For upgrading to a new phone, Huawei has also evolved their Huawei Share application allowing users to transfer all contacts, messages and apps directly with phone-to-phone communication rather than via the cloud. It was remarked that Huawei doesn't offer a cloud option, so phone-to-phone is the only way in that regard: Huawei responded saying that cloud is difficult, however the first roll-out of a cloud-based Huawei Share will be in China in the future. There are, as one might expect, inherent country-by-country bylaws with this level of cloud services which Huawei is still in the process of understanding. 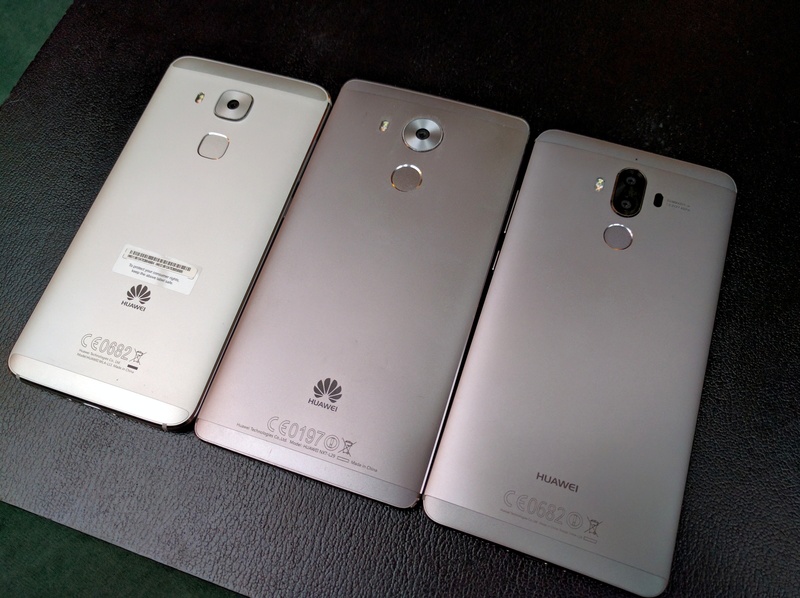 Huawei will launch the Mate 9 in five colors (region dependent): space gray, moonlight silver, champagne gold, mocha brown and ceramic white. The 4GB/64GB model will retail for 699 Euro. While talking specifications, software and features are interesting (and somewhat easier as a writer), handling a device is a little different. Huawei has kept the curved feel of the Mate series, and to a certain point there is more of a curve to it after some feedback that the Mate 8 was too shallow. 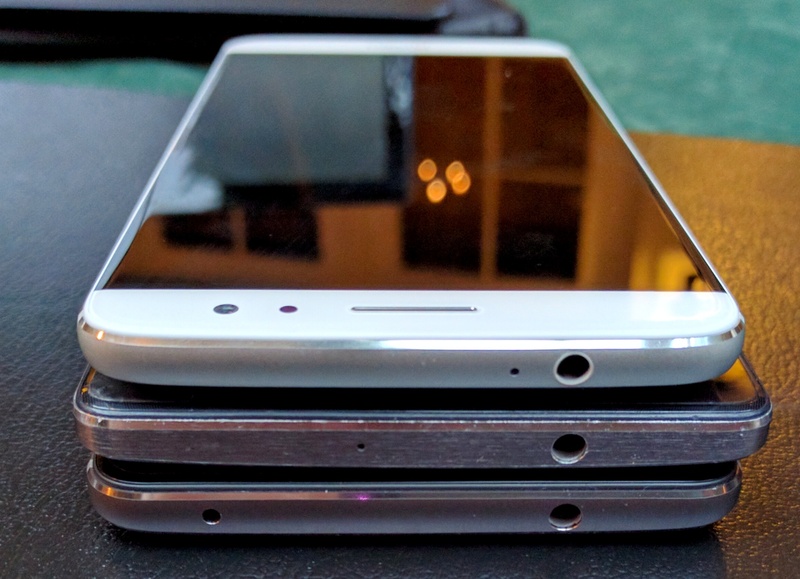 As a large smartphone user, I feel having the curved back along with the large screen is a plus - having used the Honor 8 by comparison with its glass rear feels a little odd and uncomfortable. Along with the rear is the fingerprint sensor, which Huawei has made smaller and moved nearer to the cameras. There are still only five profiles available for fingers for smartphone recognition, which annoys me slightly. I have gotten to the point where I need two fingers on both hands to be registered at different angles, and the Mate 9 will lock the fingerprint sensor after five failed attempts (rather than 10+ on the Mate 8) requiring a PIN to get in. That being said, I can't fault the fingerprint sensor for timing - Huawei has some of the fastest recognition I've seen (even compared to the 6P), which means repeated attempts are fairly quick anyway. The fingerprint sensor now also supports some gestures which can be configured in the settings. Within the first few moments of handling the device, I did notice a slight design change for the power/reset buttons. On the Mate 8 / Nova Plus / Honor 8, it was always listed as a 'feature' that the power button had a different texture to make it easier to find because both the power/reset buttons were on the same side. With the Mate 9 this feature goes away, leaving two buttons which feel identical aside from their size. I asked Huawei about the reason for the change, but unfortunately I have not had a response yet as to who decided it and why. As with all new phones, performance in the OS is snappy and seems relatively fluid. As part of the discussions, Huawei was keen to mention that some OS tricks have been employed to improve user experience and the perception of performance though 'non-noticeable' adjustments. I think I spotted one of these - in the gallery app, when scrolling through photographs, in order to avoid a state where the user is scrolling fast and images aren't loading quickly, Huawei will skip a frame or two in the UI to ensure an image preview is always present. To be honest, most phones will skip frames when doing heavy IO processing, so this isn't in itself surprising - but the fact that it is being mentioned as a 'feature' to improve UX is odd. At some point skipped frames for UX will be a thing of the past, though I can see why IO would be an obvious bottleneck. We've covered features like knuckle gestures and light painting in previous Huawei reviews, and these are also present here. The camera mode on the Mate 9 gets a small revamp, with most features now being offered as slide left/right followed by buttons, rather than a single button for settings. 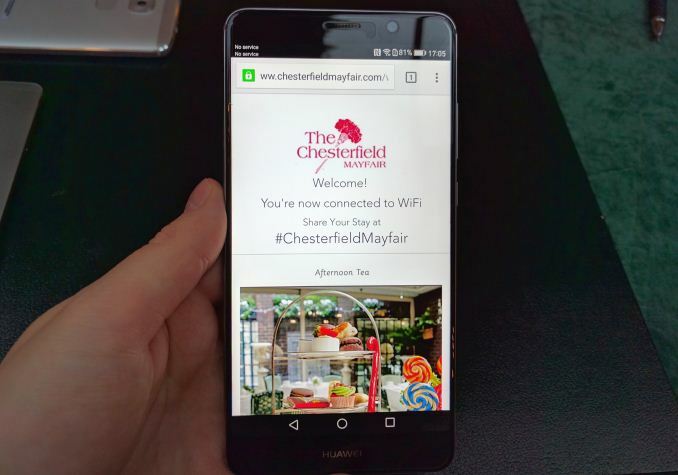 Huawei was keen to promote its new false touching algorithm whereby users might accidentally press the display when taking a photo and draw the focus away. It's a nice feature and somewhat necessary with larger smartphones, and yes it the algorithm isn't fool proof, but I'd like to cite issues I've had with the Mate 8 and false touching when covering events, so even if the algorithm is early stage it can be marked as a positive. I'll leave the smartphone dual camera analysis for Matt's full review of the device, but I can confirm it takes pictures. Some of Huawei's claims will be difficult to test in a full review, such as the long-term performance metric gathering, purely because of the time required and the need for a baseline on the same device receiving the same application profile trace. However, the A73/G71 combination in the SoC is going to be an expected performance matchup through 2017, and we'll be keen to see how the updated custom cores from the other major smartphone manufacturers shape up. If we get time with a device after the announcement, I'll try and run some basic benchmark numbers. "Some of Huawei's claims will be difficult to test in a full review, such as the long-term performance metric gathering, purely because of the time required and the need for a baseline on the same device receiving the same application profile trace." How many and which bands does this model support in the international/European version?